Need a simple but delicious dinner? 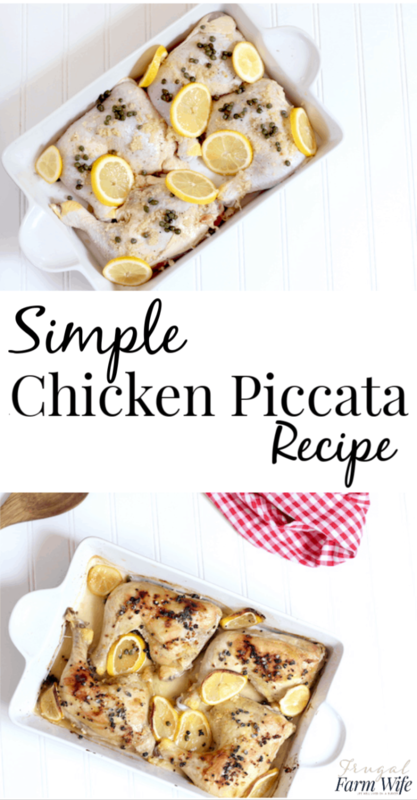 This simple baked chicken piccata recipe has you covered! You’ll be amazed by how much flavor you’ll find in such a simple dish. One of my favorite proteins to shop for is chicken leg quarters. Why? Because they’re so versatile, or course. But also? They’re CHEAP. You can go to Walmart any day of the week and pick up a ten pound bag for $5 or less, and of course, smaller stores often have sales that are even better – we see them go down to twenty-nine cents per pound occasionally! Want to serve a large amount of meat on a budget? Chicken legs are your friend! And while I happen to prefer my meat to be boneless and skinless, the rest of the family disagrees, and prefers leg quarters regardless of the price, to the whole deal is mostly a win for us. 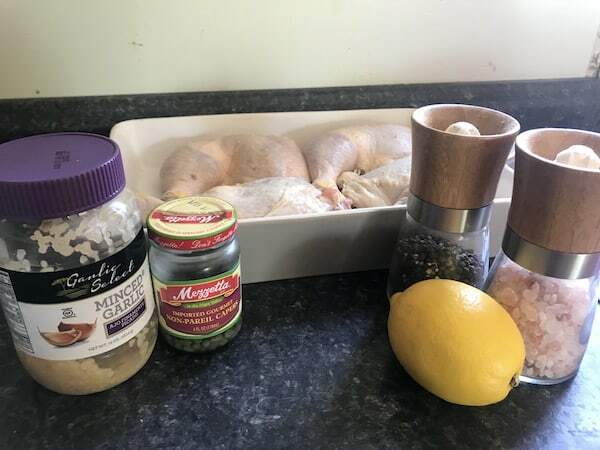 This simple baked chicken piccata recipe is one of my two favorite chicken dishes to serve my family, or even when we’re having company – the other one is instant pot chicken and rice. It’s an incredibly easy way to get big flavor, and comes together really quickly. While you’ll find chicken piccata recipes everywhere on the web – it’s a classic – I have to share mine, because it’s simpler, and doesn’t use as many ingredients as other recipes I’ve found. Not that there’s anything wrong with more ingredients and more flavor! I just find that some of them are redundant – like butter, since chicken legs already contain a lot of fat, and wine, because I don’t usually have wine on hand. I love to serve this simple baked chicken piccata recipe up with a side of mashed potatoes, and tangy gravy made from the lemony chicken drippings. Add a little asparagus, or side salad and you’re all set for dinner!